When he was trying to think of a name for his band The Lone Bellow, vocalist, songwriter and Georgia native Zach Williams drew inspiration from a particularly potent memory. One summer when he was a kid staying with his grandparents, "there was this one night where I stayed in this guest bedroom decorated like clown faces, which is unfortunate to say the least," he says. "Across the cow pasture ... there was a plastic bag stuck in a tree, but I thought it was a ghost, and then the bull bellowed out there, so I thought it was the ghost communicating with the 30 white clown faces in my bedroom just glistening off of the moonlight, staring at me." After spending a night on the shag carpet in the hallway outside the bedroom, Williams asked his grandfather what the noise was, and he said it was the bull bellowing. Since then, Williams says, the word "bellow" has had a "calming" effect on him. 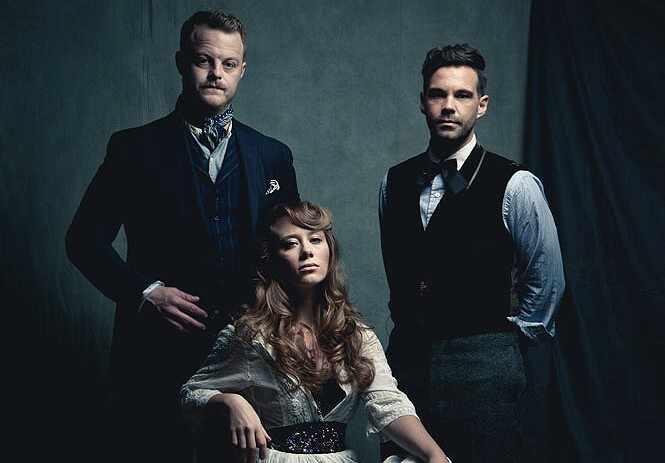 And the name The Lone Bellow speaks to the fact that "the three of us singing together, it's kind of a feeling that we had never felt before as individual singers," he says. Similarly personal stories are the focus of the New York City-based folk/country trio's sophomore album, Then Came the Morning, set for release in late January. The record is "a celebration of the mundane," Williams says. "It's just some quiet stories in there that I don't know if they would've ever been told if it wasn't for this record." To record Then Came the Morning, Williams, guitarist/vocalist Brian Elmquist and mandolin player/vocalist Kanene Pipkin holed up in Dreamland Recording Studios in Woodstock, N.Y. Housed in an old church, Dreamland is essentially a "time capsule," Williams says, filled with the original instruments and mics from when the studio was built in the '60s. There, The Lone Bellow worked with several local musicians to weave a rich tapestry of organ, guitar, strings, percussion, brass and more to accompany their impeccable, spirit-filled three-part vocal harmonies. But getting the opportunity to record with such time-tested equipment is only one reason why Williams is audibly excited for the album. The Lone Bellow's jewel of a self-titled debut release, made up of "literally the first 12 songs in our set list," he says, was recorded in 2010 when the band had been together for only two months and still had day jobs. But for Then Came the Morning, largely written while the band was on the road, "we weren't juggling anything," he says. "This is completely what we have been doing. So I feel like that headspace has allowed us to maybe dig a little deeper into our connections as human beings, and also just like the art of live music and sharing a moment with complete strangers—and that either being a very beautiful thing or sometimes like a really hard thing, but all of it basically being beautiful." For much of the songs' subject matter, though, The Lone Bellow looked closer to home, bringing together their own "journal entries" as well as what Williams calls "family lore," or rather "stories that are told repeatedly at, like, Thanksgiving, and everybody knows the story, but you love to hear it. It's probably even taken out of context a wee bit depending on who's telling the story. There's a couple lies in there, but nobody cares because ... it's somehow connected to your heritage." For example, the track "Fake Roses" is about Williams' mother-in-law, who raised his wife "as a single mom, nurse, down in Marietta, Ga., and she's just like my hero. ... It's a sad song, but I think that it's honoring her journey and her story." With his heart so close to these new songs, some of them heartbreaking, Williams says he's worried about sharing some of the most personal ones with audiences, but "you gotta do it, you gotta scare yourself every now and then," he says. "But there's also moments of joy and gratitude on the record as well. You gotta have the darkest colors and the lightest colors to paint anything worth looking at."